Bob Tisdale isn't worried. No sirree. He calls it "Alarmism Cranked Up to Absurd Level". In his denial he laughs at scientists who voice their concern that it's getting more and more urgent to address climate change. As you know, Bob Tisdale removes 30 months (2 1/2 years) of data to try to persuade his fans of imaginary differences between modeled and observed temperature. He's taken up disinformation as an immoral pursuit in his semi-retirement. Apparently his model needs some work, because after supposedly removing the effects of El Niños it still shows an uptick caused by the 2015/16 El Niño. Look at the map for February and see what you think. By far most of the heat is way up north, not at the equator. Sure, some of it will have been carried up north, but most is nowhere near the Pacific. There's an article at The Conversation by Steve Sherwood and Stefan Rahmstorf. I suggest read both that article and the one by Tamino to get a better sense of what all this means. You’ve been saying so many goofy things it’s unlikely you graduated high school. Is there any particular job you ever worked in measuring anything for money? ...The way we real scientists know you are a fake one is you say you believed in all that disjoint, thermodynamic law violating trash. ...You’ve never been involved in anything like that Toneb, and the way it’s so easy to tell, is that you think climatology is actually a field of science. Climatology is a word made up by people who were trying to separate the grants they applied for, from weather grants. You don’t need some particularly unusual experience or training to study the three phases of matter involved in climate. There’s the solid phase earth, there’s the plasma phase sun, there’s the liquid phase green house gas water, and the gas phase general atmospheric mix. The fact you’re going on about how ”climatology” is some high and mighty art reveals that you’re actually an environmentalist not even a science student. Tisdale: Apparently his model needs some work, because after supposedly removing the effects of El Niños it still shows an uptick caused by the 2015/16 El Niño. This from the people who claim to be better at science than scientists. 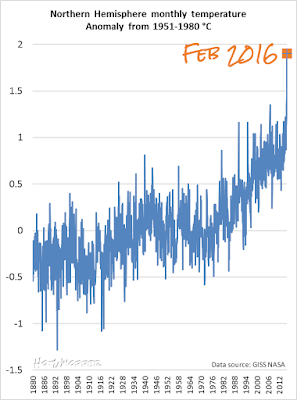 If you knew in advance that the entire peak, nothing more and nothing less, was due to El Nino there would not even be a need to analyze the data. 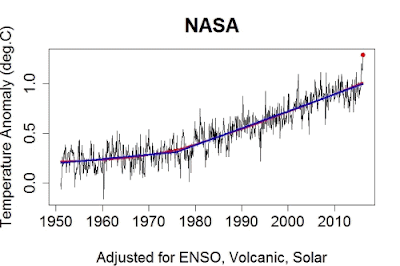 You just have to sit in a comfortable armchair and think: this entire peak was due to El Nino. Then you go to your computer and write your profound thought up and everyone at WUWT will admire you for your beautiful mind. That comment from Arn is a classic. Two months ago Bob Tisdale wrote a post where he concluded that the present el Nino wasn't as strong as 1997/1998, measured by MEI, SOI, warm water volume,etc. 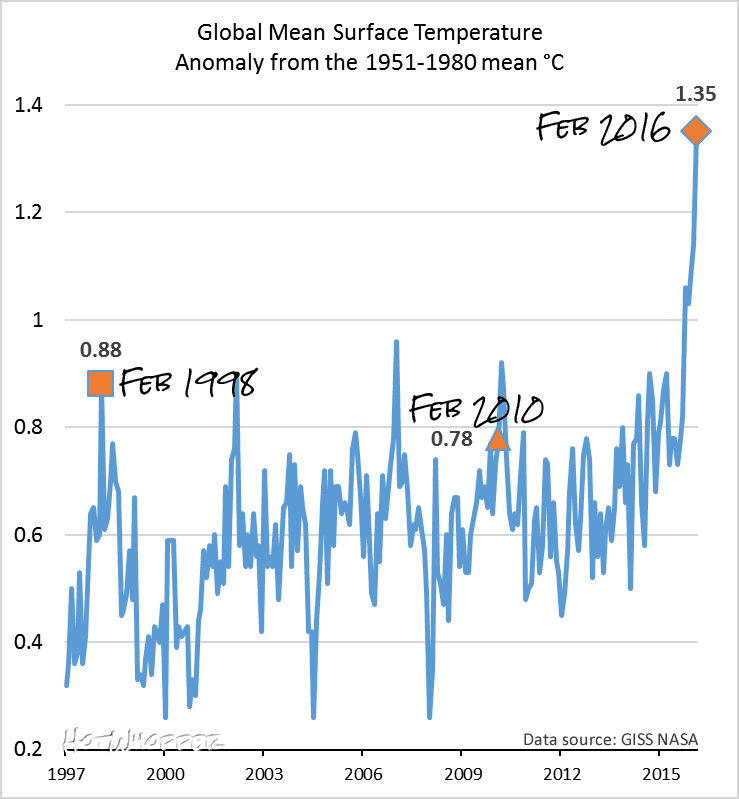 Now when this "not-so-strong" el Nino has produced a peak anomaly 0.47 C warmer than 1997/1998, Bob have to make up new excuses, instead of accepting that there might be some AGW at work here.. Anyway, 0.47 C increase between comparable el Nino peaks 18 years apart, suggest a global warming of 0.26 C/decade, quite in line with the CMIP5 model mean. But what if the present Nino is weaker than 1998 (as suggested by MEI)? 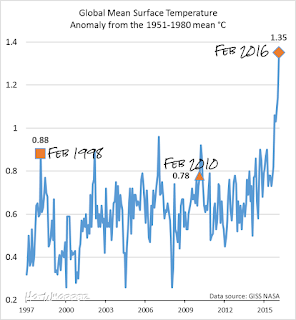 Then the actual warming must be larger than expected..
"Anyway, 0.47 C increase between comparable el Nino peaks 18 years apart, suggest a global warming of 0.26 C/decade, quite in line with the CMIP5 model mean." Bob knows that, that's why he baselines the way he does in his figure 7 to remove any reminder of the GAT trend. Oh come on, Olaf...that was SO 2 months ago! Deniers need to respond much more nimbly than that! As the said "Toneb" I truly feel honoured. I think Arn was allowed to play with the crayons today. 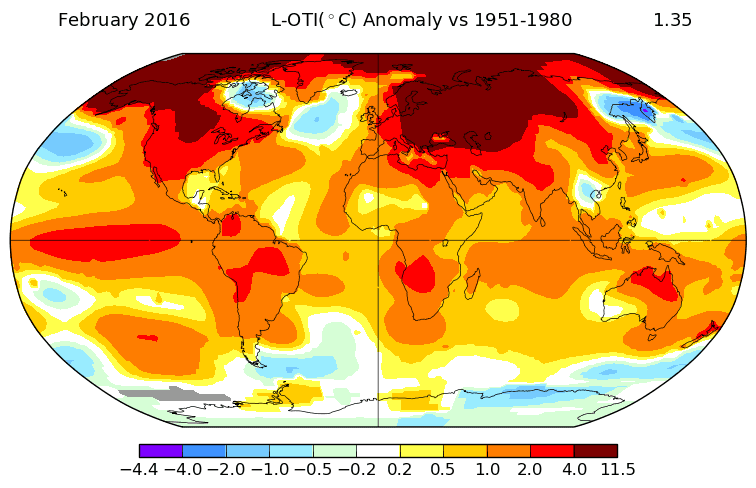 The ENSO Frigidaire has been on the fritz (the ENSO furnace is working overtime). You guys just wait. It's going to be fixed in time for the next La Nina, and the GMST is going down baby, down. In the real world though, outside the alternate reality inhabited by the LOL WHUT?! denizens, this is all becoming a bit tiresome. And missing the point that we need to address this AGW problem ASAP before we are all shortly to become toast. Without butter on it. But still somehow managing to fall on the wrong side when it hits the floor. Tisdalean ENSO heat accumulates because...it just does. "delusion is the path of least resistance"
More than that, its accurate. Wanted to say thankyou for writing it. "..... I have forgotten more about weather/climate than you have the slightest inkling of (judging by your post)." Just having a little push against Bob as well. Tisdale knows he's bust. Every graphic presentation choice is built on what he feels he should try and hide. Well, that's the necessary proof that "Arn" can't count past three ... he described four different phases of matter! He has no chance of differentiating "real scientists" from the rest. I think he spent most of his scientific education thinking up insults. And, of course, the mention of "thermodynamic law" for those playing denier bingo. "The El Niño released lots of warm water from below the surface of the western tropical Pacific, but how was that warm water created? It was created during a La Niña that came before the El Niño. This happens because La Niña events reduce cloud cover and allow more sunlight than normal to penetrate and warm the tropical Pacific. It’s all so simple, and it’s all supported by data, not by incorrect assumptions implanted while programming climate models." And it all started with the little ice age, before the there must have been some other theory. Well, sunlight does warm the oceans. Then I think maybe it leaves. "You don’t need some particularly unusual experience or training to study the three phases of matter involved in climate. There’s the solid phase earth, there’s the plasma phase sun..."
As a very wise man also once said: "Putin is a one-horse country: Oil and energy..."
Anthony is not the only one who has a severe and sad Tisdale problem, I have reason to believe that Dr Curry has also become reliant on Tisdale to get her through a hard day. Judith PLEASE, for the sake of your reputation and that of GT you must acknowledge the danger sings and seek advice. Your tippling has escalated into binge Tisdaling. "Judith PLEASE, for the sake of your reputation..." - not the kind of thing I'd call out at a thug. And yes I DID link to National Review. Got a problum wif dat sciency guy? Lots, truly lots of royalties for me, then. Plus for 'climate revisionists' which I saw taken last week for the very first time this perfect meme got used. ahah, that is fantastic, Conspiracy and demagoguery website Breitbart calling conspiracy theorist and demagogue Trump a "thug"
But Trump's are the wrong conspiracies and demagoguery!